This September, 79th running of the UCI World Road Cycling Championships was won on a BMC teammachine SLR01. To honor that huge accomplishment, BMC is challenging you to go out and complete a ride of 79 miles (or greater) in one day. Pick your favorite long training ride, prep your bike, fill up some bottles, maybe even sport a little bit of Belgian red/yellow/black, and push yourself to make it happen! Note: The Challenge is to complete a single ride of 79 miles (or greater) in one 24 hour period. You have a three day window to make this happen and can make multiple attempts. Manual entries will not count towards your Challenge effort, nor will trainer rides. Sunday traditionally being group ride day, I thought I'd combine the two. So, on Sunday morning, I met up with the group and set off up to Takao (where I visited last Tuesday). The hill felt much easier this time (probably because I was fresher) and we were soon at the top and enjoying some quality autumn leaf viewing. 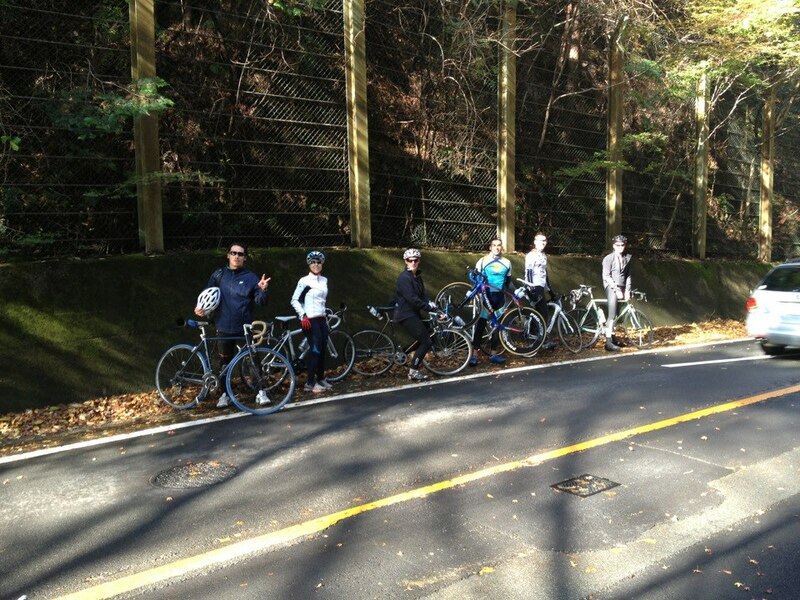 Our little peloton at the top of the hill leading to Takao. Left to right: Rafael, Grecia, me, Iago, Jamie, Alexander. Photo by Cory. With a couple of hours of momiji under our belts (bib shorts?) and followed by a brief lunch stop at a convenience store, I set off accompanied by Rafael and Grecia... this time, to complete the challenge. I thought I'd ride to Kizu and back - about the right distance and relatively flat, so fairly appropriate for a track bike. Grecia and Rafael had to turn back about 1/3 of the way to Kizu due to prior commitments at home, leaving me riding alone save for my iPod (I never usually ride with one, but this time I'm certainly glad I brought it along... and glad I chose a route where it was safe to listen to it!). I should note that Cory, Jamie and Iago set off on a separate mountain route to complete theirs. They all have geared road bikes! Their route took them on about 4000 m total elevation gain, which is frankly insane. Of the three, only Cory completed the challenge - Iago got a puncture and didn't have a spare tubular, so had to get a lift home, and Jamie was 10 km short when he got home and too tired to seek out what was left! Well done, Cory! The ride to Kizu and back was less eventful. The weather initially looked threatening and I got one or two bursts of light drizzle, but it soon cleared up. I had a wicked headwind for the last part of the return journey into Kyoto, which wasn't really what I wanted, but I pushed through that ok.
Sure beats another bottle of electrolyte drink! 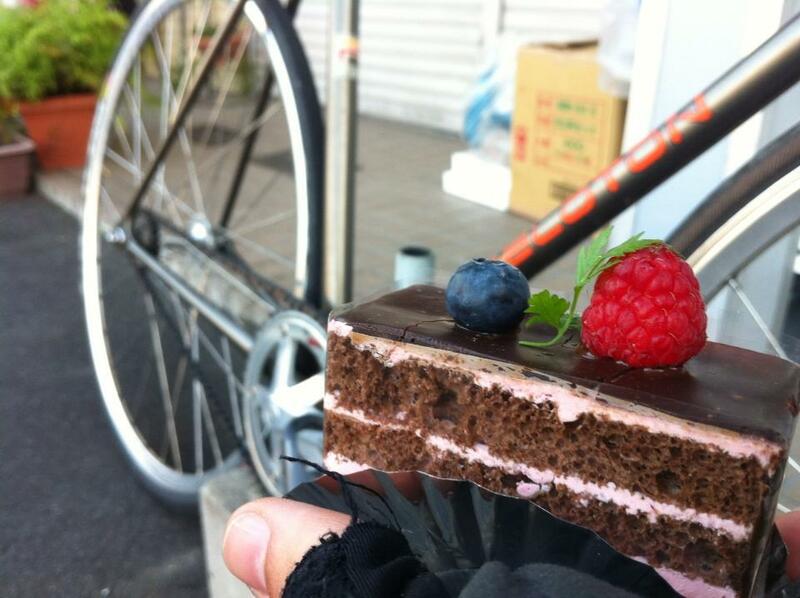 I arrived back in Kyoto about 15 km short of my goal, so I rode up to university and back. It was at this point that it decided to rain quite heavily. It was also dark. And I was pretty tired. Consequently, I can describe this last section as "less than pleasant". Total distance 127.7 km (79.3 mi) - CHALLENGE COMPLETE! I think on a road bike it wouldn't have been particularly special and I think Cory and crew's decision to liven it up with a pretty horrendous mountain route was probably a good one overall. On a track bike, wholly unsuited to long-distance riding, I think one climb was enough and I don't think I'd like to ride much further! Fixed gear means your legs are perpetually in motion and that certainly wears you down. My legs were feeling it for a couple of days afterwards and I've definitely tweaked my knee slightly, which means a week or so off from riding (the horror!). And after all that, what do I get? A virtual badge on my Strava profile and a feeling of satisfaction. Worth it? Most definitely!